Captain Blackadder, Lieutenant George, and Private Baldrick see joining the Air Corps as a great way of sitting in a classroom instead of fighting on the front lines. 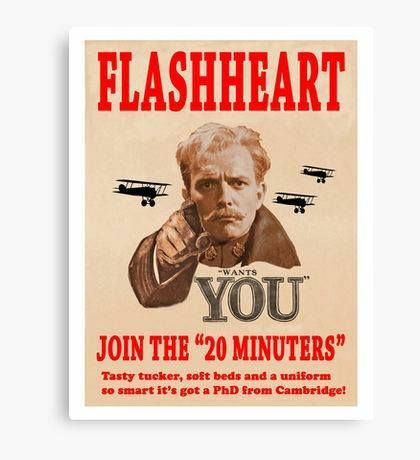 Unfortunately for them, the course is taught by Squadron Commander Flashheart, who lives for danger- much like his nemesis, the infamous Red Baron. 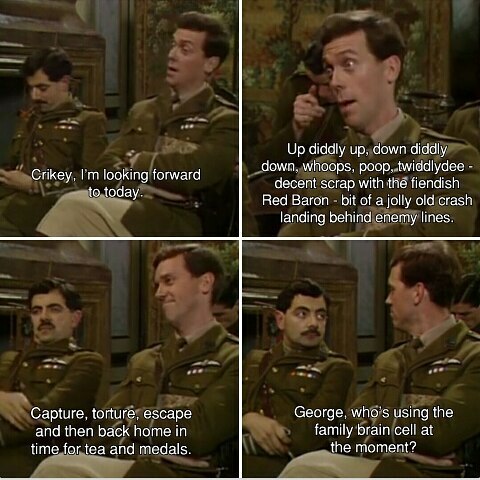 Blackadder joins the Royal Flying Corps in order to escape the trenches. Unfortunately, on his maiden flight as a “20-minuter”, Blackadder – with navigator Baldrick at his side – is shot-down behind German lines, and captured by their number 1 flying ace, Baron Von Richthoven. Lord Flasheart battles the Red Baron in order to rescue them. The chirpish, upbeat and incredibly naive attitude that George has is amazing. This is probably his best Blackadder Goes Forth quote. We’ve put a clip of this scene below as well. then back home in time for tea and medals. BA – George, who’s using the family brain-cell at the moment? You can check out the full script here for Blackadder Private Plane. If you want to have a look at more quotes from Lord Flash, take a look here – Captain Darling? Funny name for a guy.